SkyVac offer a wide range of Gutter Cleaning Tools & Accessories to fit their External Gutter Cleaning and Internal High Reach Vacuuming systems. Spinaclean is renowned and respected as one of the most innovative and pioneering businesses within the International cleaning industry. Its reputation has not only been built on the quality of its groundbreaking products but also on its unparalleled customer care and after sales service. Andy Whiting the MD of Spinaclean sees this aspect of the business as the company’s highest priority. 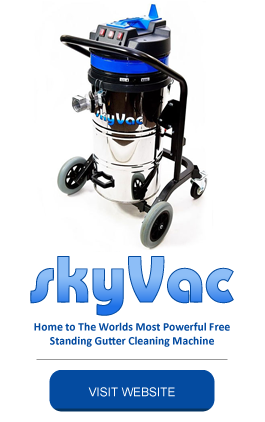 SkyVac the bespoke and specifically modified gutter-cleaning machine is the leading selling product of its kind in the world. The system has been developed as a result of extensive research and development, specifically taking into consideration the feed back and requirements of our customers. The award winning SkyVac is 30% more powerful than its nearest rival providing the most robust all terrain chassis, the only blockage free side entry system, the lightest and most manageable tapered carbon fibre poles and the most effective clip and clamp free end tool operating procedure. Gutter cleaning has never been easier especially with the SkyVac recordable camera that is utilised to attain the most accomplished result. Particularly when used with the SkyVac Inspection pole to realise the potential of site surveys for the purpose of providing quotes and identifying your man power and man hour requirements. Spinaclean continues to evolve, working closely with other market leaders, taking the opportunity to develop, research, trial and test new innovative products and technology. We are extremely please to say the Spinaclean ethos is to provide on going support and advice to all our customers, which currently includes innumerable sole traders, maintenance businesses including roofing and drainage companies, Housing associations, County and Borough councils, Private estates, Universities, schools and colleges, airports and other national institutions.